Kili acquires NFC microSD pioneer DeviceFidelity. American Banker lists Currency Cloud, BioCatch, Linqto, VerifyValid, and Rippleshot as top 10 tech companies to watch. Fintech in the fall: themes and company updates from CAN Capital, Encap Security, Fuze Network, Guardian Analytics, Larky, Ripple, and Xpenditure. American Banker examines 2015 plans for FIS, Fiserv and Diebold. Forbes looks at the success of RoboAdvisors: Betterment, Wealthfront, Personal Capital, and SigFig. Forbes examines Kantox’s P2P FX trading technology. TSYS partners with FICO to deliver a marketing product for card issuers called TSYS Targeted Messaging. Digital Insight enters reseller agreement with Guardian Analytics to deliver anomaly detection services to financial institutions. Trulioo wins 2014 Canadian Technology Companies to watch award from Deloitte. Huffington Post interviews Andrea Gellert, SVP Marketing at OnDeck. Fall is in full swing and there has been plenty of news to keep the fintech world busy. CAN Capital (fka Capital Access Network) has supplied just over $4 billion in funding to more than 55,000 small businesses. It continues to expand, reporting double-digit growth from last year. CAN’s financing works well for small businesses who cannot obtain funding through traditional bank loans. Its 60%+ approval rate is made possible by the robust tech and big data analytic capabilities that enhance market insight. This ultimately broadens CAN’s access to prospective clients and enables it to provide customers with a lower priced loan. In June, it launched the beta version of CAN Connect, a set of 4 APIs. One of these APIs is called CAN Instant Quote (IQ). It pulls data from software that a small business uses frequently, such as scheduling or accounting software, to pre-approve them for instant financing. In November, CAN announced a partnership with Yodlee to extend funding through its small business offering. This will enable Yodlee’s financial institution clients to offer customers access to funding via CAN’s Instant Quote API. The service will be available by Q1 of 2015. While fixed term loans are still CAN’s core product, it is currently looking into offering flexible payment terms in 2015. See CAN Capital’s demo from FinovateFall 2013 where it debuted Mobile Funder. Encap Security offers Smarter Authentication, a seamless way for banks to authenticate users across multiple channels, without disrupting the user experience. Several weeks ago, Encap partnered with Feedzai to leverage its analytic engine that authenticates users. When the customer’s identity is in question, they are sent challenges to authenticate themselves, rather than being shut out of the system entirely. Other partnerships are in the works, but all are confidential at this point. 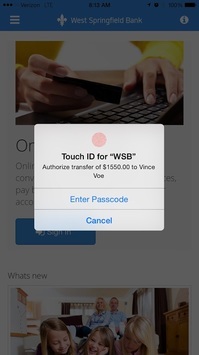 Additionally, Encap has recently integrated Apple’s Touch ID to replace users’ PINs. While Encap’s Smarter Authentication will still be the underlying technology, Touch ID will help authenticate the user at each point of interaction. The company plans to incorporate other biometrics in the future. Watch Encap demo Smarter Authentication at FinovateSpring 2014. As we tweeted last week, Fuze was recently acquired by Ingo Money, a company that specializes in mobile check cashing services for underbanked consumers. Ingo enables customers to instantly deposit checks onto a prepaid card, bank account, or mobile wallet. Ingo is also working on solutions to help users avoid late fees by enabling them to send funds to a location of their choice, such as their landlord. Additionally, it plans to expand the number of retail locations where customers load cash and move money from card to card. The terms of the acquisition, which is set to be finalized by the end of this year, were undisclosed. Fuze Network last demonstrated at FinovateFall 2011 where it debuted Swipe2Pay. With a swell in data breaches this year, security has become a hot topic with the half-billion personal identities stolen in the last 8 months. The increasing number of new solutions and capabilities banks now offer has opened up fresh opportunities for fraudsters to compromise users’ identities. To combat this, Guardian Analytics has added capabilities that gather user reputation data, such as their IP address. Guardian Analytics is working with more than 300 financial institutions and has expanded its partnerships outside of banks. In the last year and a half, it has partnered with two non-bank institutions, Fiserv and Digital Insight. In the future, the California-based company plans to expand its analytics-based security solutions, since rules-based security is failing under the ever-expanding number of requirements needed to protect institutions. Guardian Analytics debuted FraudXCHANGE at FinovateFall 2012. Larky, a company that provides card-linked discounts and offers on a mobile platform, signed six new financial institution clients across Alabama, Michigan, and New York in October. Each new client is using a white-labeled version of Larky’s platform coupled with a package of local offers and rewards. The offers not only save users money, but also drive traffic to local business, and increase card usage. 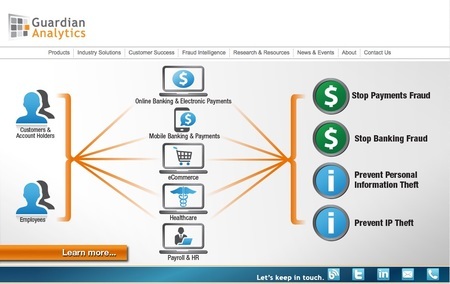 Check out Larky’s demo from FinovateFall 2014. Open source payments protocol, Ripple,announced a partnership with Yantra, which specializes in electronic payment systems. Specifically, Ripple will use Yantra’s risk management capabilities. The Ripple network increases the speed and velocity of transactions, which add to its risk. To mitigate the liability, it leverages Yantra’s technology to create context and conditionality to its money movement processes. Yantra will augment the data collected about transactions and is adding new tools, such as custom search fields, to better analyze the data, and all within seconds. Ripple debuted at FinovateSpring 2013. When we last spoke with Xpenditure at the beginning of this year, the company had $2.2 million in Angel funding and 15 employees. By the end of 2014, it will have raised $3.5 million in total funding and expects to have 25 employees. It is also expanding its operations. It recently opened offices in São Paulo and New York City. In fact, the U.S. is its fastest growing market and accounts for 30% of its customers. In late October, it launched a partnership with MasterCard and its expense management system will be available as a part of MasterCard’s Business Owner ToolBox in Canada. 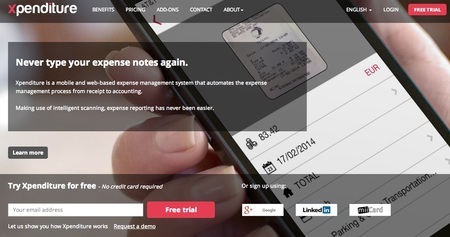 Check out Xpenditure’s demo from FinovateEurope 2014. Larky is next, demoing its unique web+mobile platform that helps financial institutions boost loyalty, reduce churn, drive non-fee income, increase wallet share and support local businesses. “Our turnkey system sends users location-based and FI-branded smartphone alerts when they are physically near a merchant discount. Users save $1,000 or more every year, with no behavioral changes. Larky helps you deliver significant added value to your audience so they never again wonder if they should be banking somewhere else. Top of wallet, top of mind. We are unveiling our new Android app along with our new white-label mobile and web option. After resting up over the weekend, we hope you’re ready to take a look at six more companies that will demo their newest fintech creation in New York City at FinovateFall this September 23 and 24. Don’t miss out; get your ticket here to be a part of the action. Business Centric Services Group (BCSG) is a cloud- services brokerage offering business apps for small businesses via FIs with a platform reaching over 4 million SMBs worldwide. Its platform will continue to evolve with the market. Whatever it does, it will always start with the small business need. Prior to BCSG Davis spent 10 years at Barclays where he was Marketing and Product Director for Barclays Business, and also Managing Director of Clearlybusiness. Before joining BCSG Garney held various technical and project delivery roles at Hewlett Packard Enterprise Services and De La Rue. Diebold furnishes the ability to effectively identify, engage, service and anticipate the needs of customers across your self-service and assisted channels will differentiate your brand. Larky delivers engagement and loyalty through a unique platform that provides point-of-sale discounts at local and national merchants and magically reminds users of offers at the right time and place. Successful start-up entrepreneur with substantial experience identifying and developing products, services, and business relationships with high ROI. Passion for creating compelling new solutions. MaxMyInterest by Six Trees Capital LLC is an intelligent cash-management solution that helps investors earn up to 0.80% more on FDIC-insured bank deposits, rebalancing funds automatically as rates change. Max brings efficiency and transparency to the $12 trillion market for cash, making it easy for investors to securely and effortlessly increase the yield on the cash portion of their portfolios. Zimmerman is an investor and entrepreneur, focused on financial technology. Prior to founding MaxMyInterest, he was an investment banker at Citigroup. He graduated from Harvard University with a degree in economics. Wu leads the technology development team and is an expert in interface design. He graduated from the University of Illinois at Chicago with a degree in Computer Engineering. Sonavation empowers trust through ultrasound technology by creating more secure environments in which to access sensitive financial data, conduct non-cash transactions and offer peace of mind. Sonavation is on a mission to replace passwords and PINs with highly secure biometric solutions, leveraging the power of ultrasound to deliver piece of mind. Stewart is the Chief Operating Officer at Sonavation, currently focused on delivering the convergence of physical and cyber security. TickSmith has built the first commercial Big Data platform for financial data. TickSmith provides out-of-the-box, previously unavailable possibilities to exploit financial big data. Seasoned financial data and technology executive and entrepreneur with 28 years of experience. Entrepreneur, consultant and IT Architect with 17 years of experience developing, architecting, deploying and running technology solutions and infrastructure for banks, travel and IT companies. Check back this Thursday to see another six companies that will demo at FinovateFall 2014.